Please ensure that your My Cloud product firmware is up to date. The My Cloud Mobile App is not able to communicate with the My cloud device due to one of the following reasons. Important: The instructions below are designed to assist in troubleshooting remote access issues with MyCloud.com. Please try one solution at a time and test for resolution before continuing with the next item. Login to the My Cloud Dashboard. 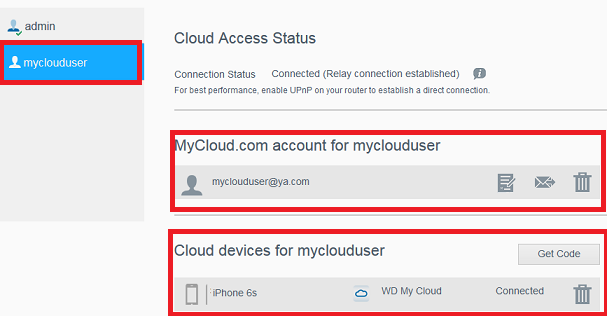 Select a user from the list to verify if a mobile device is connected and if the user has a MyCloud.com account. If the steps above have not resolved the issue, power off and on all networking equipment. if the steps above have not resolved your issue, the My Cloud device may restore a reset.